Russian Prime Minister Vladimir Putin today declared victory in the Cold War following the news that the US government was to nationalise large swathes of the American financial system. "It is clear, as the sub-prime mortgage debts begin to default and the US government starts to take possession of homes, that the ideals of Marxist-Leninism are the only solution for the working people of Cleveland," said Mr Putin. "I welcome President Bush’s plan to create the largest state-run social housing project in the world." 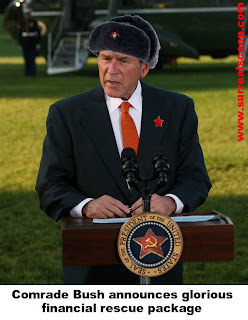 President Bush, speaking from the lawn of the newly named ‘White Kremlin’ in Washington D.C. said that the new $700bn nationalisation was a ‘bold approach’ to the current financial crisis caused by flaws in the economic system. "This, comrades, marks a glorious revolution and a new birth for the United Socialist States of America," he said. "No longer will multi-millionaire capitalists be kept awake at night by the threat of having to cancel their caviar orders. I am commanding each and every hard working American to rise up and underwrite every single dubious and morally hazardous decision that they have made," said the President sporting a new red-star lapel pin-badge. The President announced further plans to aid struggling companies in other industries such as motor manufacturing. "Today, I asked Congress to approve, on pain of death, a glorious five-year plan to bail out the executives of General Motors and Ford," he said. "Congress will ensure that at the plan’s completion every home will be the proud owner of a marvellous red tractor." Reporters asked if the US consumer really wanted a tractor and whether or not this was an environmentally sound solution to the collapse of the US economy. "Every citizen of the USSA will want to do their bit, or do they want to go to the Guantanamo gulag?" said Mr Bush. "Without a tractor how else will all comrades across the USSA plough their new collective farms?" When asked what this might mean for other expensive projects, such as Space Exploration, President Bush ended his address from the ‘Washingtongrad Inner City Farm' – formerly the ‘White House Lawn’ – on an upbeat note. "One way or another, I intend to ensure that man dominates a new Red Planet." LOL! The problems of the Red States! I am a history pedant and I am not sure Ruskifying US places would work like that. Well observed and funny. Good satire.